I LOVE this one Ali!!! This one is my favorite! But I just love Kim! I coudn't think of a more deserving couple! This picture definitely captures your personalities! ADORABLE!! BEST PICTURE OF ALL! You guys are so cute together! Can't wait to meet baby Cover! Love this!! fun fun fun! Team Cover all the way!!!! Love you sweetie! Best family I have ever known! This would be my vote. She definitely has that pregnancy glow and just a touch of, "I'm so ready for this baby to be born." Amazing picture! Love you guys!! Perfect! I wish I had a picture like this when I was expecting. Best ball picture I have ever seen! Love it! The BEST expectant parents picture I have EVER seen!!! Love how fun this one is! Team Cover all the way !! These two are priceless and so are the three little guys that come with them. LOVE, LOVE, LOVE THE COVERS!!!!! Team Cover is the Bestest Picture and that comes from DAVIS6 House. First they choose not to take a stuffy "norm" picture for a Military Ball that we are use to. Look at the Pure joy on both thier face makes one smile an want to be pregnant. Kim didn't wear Black THANK YOU but choose a colour to wear how awesome is that. I mean she embrace her pregnancy with glory and smile AWESOME! Look at them the Beauity of being pregnant is all over this photo the "glow" you can see this pregnancy, the joy and love shines bright from the two of them.GOD gave them a GIFT of a child an they show that here. This is DAVIS6 thoughts on this matter. They both were showing the beauity of the baby's house (if you will) and how being in uniform doesn't mean being "uptight" always. This photo is Easy and Flows it's LOVE, JOY,HAPPINESS AND PEACE they are ready and want to welcome thier son to this world. HAPPY CONTEST TO YOU ALL. Go Team Cover!!!!!! I love the fun!!!! Love this, such a fun photo!!! Fun Fun Fun, Love is in the air with this one! Truly shows the excitement of an upcoming blessing...LOVE this one. I love it! I hope they win. EEkkkk Love this, hands down this couple should be the winner!! This is beyond my favorite!! They are the most loving couple and Kim is my battle!!! Love you guys! Everyone should vote for this couple, they look like fun!! Ali this one is so cute! 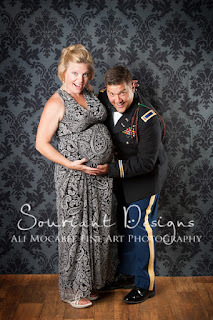 Oh my this is adorable, I bet their newborn session would be just as cute! This is my vote!!! They are the cutest! This is the best couple, I just love their expressions! This couple gets my vote! She has got to be the cutest pregnant lady ever! And he is a handsome daddy! She glows and his smile is blinding!!! Awww...this is a great photo!! Two of my favorite people in this world! LOVE this!!! Love!!! Such a wonderful, happy photo! Aww! I can't wait to see pictures of the newest addition! Maybe we'll get to see you guys if you are in Iowa at Christmas?? Love team Cover... Cutest ball picture ever!! how adorable, this is great! yay, you guys are so cute! Ali this is the best ball photo ever! wow this is a close race, hope you guys win this! Hands down best ball picture. Oh wow how stinkin cute are they, I bet they would be awesome for the newborn session! Ali Mocabee you take some amazing pictures! This one is the best, they get my vote. Not the typical ball picture, I love it! Stacy I agree Ali is so talented! Team Cover, Team Cover, Team Cover!!!!!!! how wouldn't want to have a session with this fun couple!! lol Amy Uber cuteness for sure, they are adorable! Ha Amy sent me too, but they would for sure get my vote any how! Voting for the cutest couple ever! Ryan leon sent me to vote for Team Cover! Love the picture, anything to support our service members! Claudia yes it is a cute picture and Ryan is always so out of the box but hey glad to support! Mike the crazy asian and Ryan the insane voter for random stuff! Kim and Jeremy you guys are super cute and wow you look like you are about to pop!